What is it about “gift horses” and lunatics that always makes the latter so determined to pry open the former’s mouth and peer inside? This Gallup Poll (named after the aforementioned horse?) found out that 42% of Americans are convinced Bush has the power to manipulate gas prices around the world and do it all right before an election. You’d think by now these tinfoil hat people would have just thrown in the towel and acknowledged Bush’s X-Ray vision and ability to leap tall buildings in a single bound. Interestingly, in the 2004 election 48% of idiot Democratic voters voted for John Freaking Kerry and when you compare that to the poll below where 42% believe Bush has superhuman powers of global economic manipulation and 5% have no clue, it all kinda matches up, don’t it? Well, there is that 1% who have regained a foothold in reality since 2004, it seems. I’m surprised MSNBC had the guts to admit that two-thirds of those polled were registered Demoncrats. The other third were probably sampled from a large group camped out at Roswell, New Mexico. This is just plain silliness, folks. How can Bush, who is an “alcoholic, cocaine-addicted dumbass cowboy” (according to them) be at the same time a financial wizard and genius at manipulating the global economy with a wave of his magic wand? With that said, you may now proceed to take your obligatory grain of salt and read about the latest conspiracy du jour from the Looney Left. While you’re at it, consider how much loonier they are going to get a month from now when Bush steals another election! Prozac, anyone ... ? There is no mystery or manipulation behind the recent fall in gasoline prices, analysts say. Try telling that to many U.S. motorists. Almost half of all Americans believe the November elections have more influence than market forces. For them, the plunge at the pump is about politics, not economics. 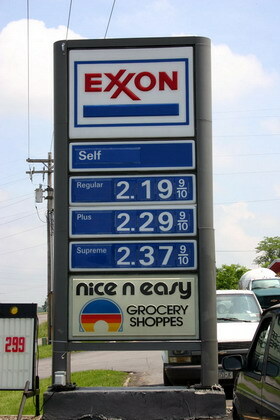 According to a new Gallup poll, 42 percent of respondents agreed with the statement that the Bush administration “deliberately manipulated the price of gasoline so that it would decrease before this fall’s elections.” Fifty-three percent of those surveyed did not believe in this conspiracy theory, while 5 percent said they had no opinion. Almost two-thirds of those who suspect President Bush intervened to bring down energy prices before Election Day are registered Democrats, according to Gallup. “It also raises the question, if we’re dropping gas prices now, why on earth did we raise them to $3.50 before?” Snow said. The excitement — and suspicion — among U.S. motorists follows a post-summer decline in gasoline prices that even veteran analysts and gas station owners concede has been steeper than usual.